A tasty recipe that sounds more complicated than it really is. The key factor is to rely solely on good quality ingredients, and half of the job is done. 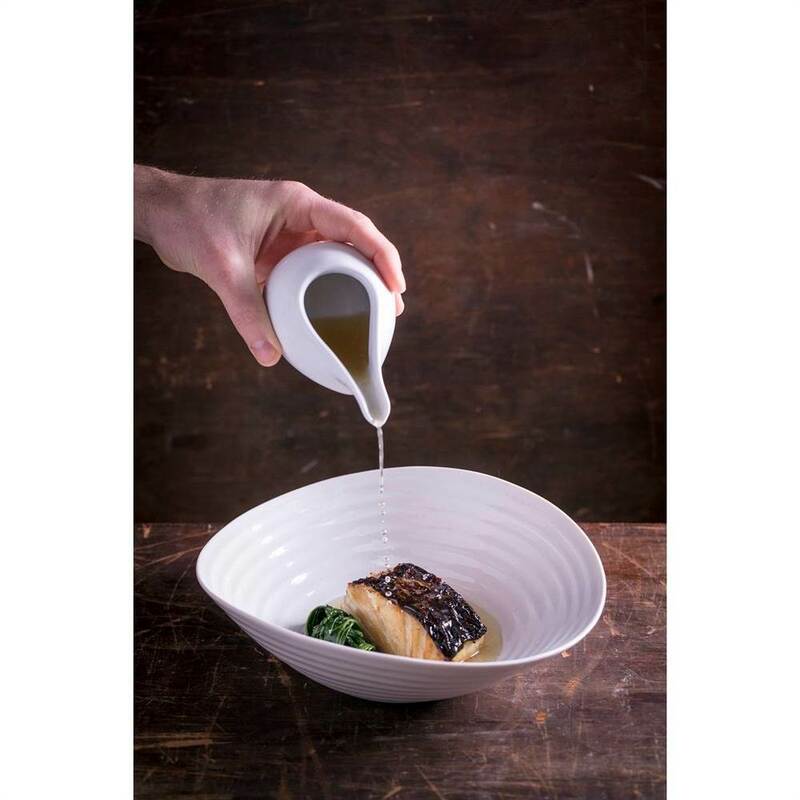 The acidity hint of the Prosecco DOC marinade cuts through the fattiness of the cod and elevates the dish to new level, and the rich Grana Padano broth brings everything together giving extra depth to the umami flavour. Start the day before with the Grana Padano broth. Place the cheese rind, the celery, a couple of garlic cloves, a few fresh herbs and 1 onion, into a big pan with 4lt of water. Bring it to boiling point, add a pinch of salt and leave it to simmer for about 4-5 hours. Next, cure the cod fillets with a pinch of salt and leave them in the fridge for at least 5 hours before you marinate them. While the broth is simmering, prepare the Prosecco DOC marinade for the cod. In a small pot bring to the boil the Prosecco DOC with 500ml of water. Add 1 garlic clove, 1 onion, a small bunch of fresh herbs, one tablespoon of honey and let it reduce by half on a low heat. Once this is ready, season it with a touch of salt and pepper. Place the cod fillets in an airtight container and once the marinade has cooled down pour it on top of the fillets. Let them marinate overnight in the fridge. Once the broth is ready pass it through a fine sieve and get rid of the Grana Padano rinds and the vegetables. Allow it to cool down overnight. The day after, wash and blanch the green chicory leaves in salted boiling water and cool them in iced water to retain the green colour. To clarify the Grana Padano broth, mix the 2 egg whites with the grated Grana Padano, one tablespoon of chopped onion and chopped parsley and season with salt and pepper. Add this egg white base mixture to the cold Grana Padano broth. Now bring the broth very slowly to the boiling point without mixing it any more. When the egg white mixture starts to cook, it will solidify and while doing so, collect all the impurity in the broth, making it crystal clear. Simmer it for a couple of hours and let it reduce by ⅓. Slowly and carefully pass it through a fine sieve lined with a clean kitchen cloth. Drain the cod fillets from the marinade. Pat dry with a clean towel and roast them in a hot pan for 3 minutes each side with just a drizzle of extra virgin olive oil. Stir fry the wild chicory leaves in a pan on low heat with a drizzle of extra virgin olive oil and 1 smashed garlic clove. Season to taste with salt and pepper. Plate the chicory in the middle of pasta bowls, put the roasted cod fillets on top of it and pour lastly the hot Grana Padano broth.